I was introduced to Thinking in Systems by Donella Meadows back in the 90’s. Applying her principles of sustainable stewardship was a challenge. It took me five years from 2004 – 2009 to downsize and transition into a simpler, minimal resource, substantive lifestyle. “Systems thinking is a management discipline that concerns an understanding of a system by examining the linkages and interactions between the components that comprise the entirety of that defined system.” Fixing one part doesn’t cut it. Hence, why it took me so long. For tiny house on wheels designers, builders, dwellers and enthusiasts, that means examining all parts of your tiny house design, your lifestyle needs, and understanding the impact and interactions between your environmental, social, cultural and economic responsibilities. It was not until 2012, after several workshops and fundraising that I began to design and build the Silver Bullet Tiny House. 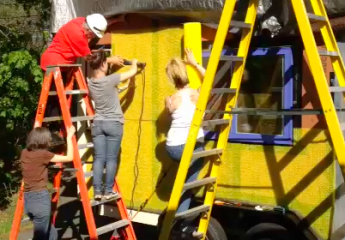 At tiny house festivals, tours and my workshops I am constantly asked how I did it. There is much information here in the website archives and I also wrote about my journey and gave details about my build in my first e-book, Living the Sustainable Lifestyle. My second e-book, Living the Sustainable Lifestyle Workbook is the playbook that will, through a series of exercises, help you design your own sustainable lifestyle. And I guarantee you, it won’t take 5 years, like it did me. You can do it in ten weeks because I have made all the mistakes, done the research and can help you do it. My life is still a work in progress and my Silver Bullet Tiny House has gone through many changes evolving as I go to a more efficient, zero-waste, all renewables, off-grid functional home that is mobile, safe and free of fossil fuel dependencies. Here are some useful reduction tips and tricks I used to lower my carbon and water footprint. After calculating my wattage usage for my few appliances and electronics, it was easier to find a renewable energy solution. These simple practices and others have saved me considerable time and money, giving me greater opportunities to socialize and travel while saving the planet for my child and her children and other generations to come. • I save 35 gallons of potable water a day (at my age 5 flushes @7 gallons per), or 12,800 gallons per year with a compost toilet. By composting your organic material, you are able to sequester 80 pounds of carbon into usable fertilizer. Read Humanure, a great handbook. • With 3 ‘military showers‘ a week you can reduce your water usage to 6 gallons a week or 312 gallons a year. I will warn you, it takes a couple of weeks to perfect your technique! • 90% of my evening lighting comes from solar sources, the remaining lights are 12V LED’s. • 70% of the year I cook on my Biolite grill/stove which charges my electronics while I cook, make hot soup or tea. The other 30% I use a toaster oven and small electric one burner unit. Making cold press coffee is not only healthier for you, but saves considerable energy. • I have had two generations of wood-burning stoves, even as small at 12″ square and they were both too hot for my 34R value building envelope in 148 SF tiny home on wheels. Currently I am using a small electric unit which only requires evening usage during the Fall, and all day usage during the winter in New England. I am still searching for an even smaller wood stove (I like seeing logs burn, even tiny ones!) or other evolved heating solutions. • I have reduced my appliances to a toaster oven, small burner unit, a tiny refrigerator, my 4 gallon water heater, my 12V pump and the occasional use of my VitaMix, which allows me to get by with a 2000W solar system. • I maintain an exterior organic garden and a vertical garden (herbs and lettuce) that uses water that I harvest from rain. A 10′ x 12′ garden plot requires 74 gallons of potable water per week. By water harvesting, I save up to 3,500 gallons of potable water per year! This obviously is adjusted based on rain, your water harvesting system storage size, etc. Although these are just a few sustainable tips and tricks I utilize, a more extensive design and strategic plan can be found in my handbook. Next week I will go into more details about that calculation and my clean energy solar solution for the Silver Bullet Tiny House. *This does not include indirect water consumption for other environmental services. For example, how much water it takes to grow the vegetables I eat, make the t-shirt I’m wearing, etc.